But as Sock had the previous year also won the junior boys title in Flushing Meadows and, with legend holding that he had never lost a high school match, it was natural — at least hopeful — to think he might have a healthy share of winning genes to go with his booming serve. 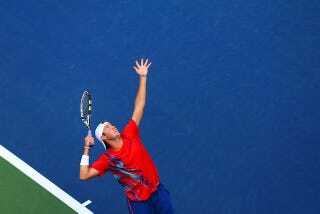 And his name, for goodness sakes, is Jack Sock; of Lincoln, Neb., a proud Cornhusker. Does it get any more wholesome and hearty for a country in a continuous search for its next men's star in this athletically enhanced smash-mouth era? Wholesome! Hearty! Harvey, stay just the way you are. Some people might like to tell you that the name "Jack Sock" doesn't conjure up anything wholesome at all, but those people are just immature. Don't even bother googling it, I'm sure nothing will come up that would change your mind. One or two more performances like this and we can expect a slew of word play headlines, beginning with Sock and Awe. Hm, that last one sort of got away from us. Still: Jack Sock! We hope he wins handily.